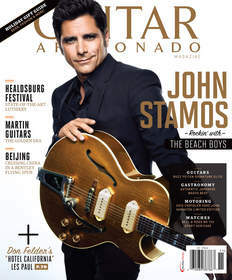 NEW YORK, NY--(Marketwired - Oct 10, 2013) - Editor-in-Chief Chris Gill is thrilled to announce John Stamos is the cover feature of the November/December 2013 edition of Guitar Aficionado magazine. This issue is out on newsstands everywhere and available digitally at the Apple App Store, Amazon Kindle, Nook by Barnes & Noble and Google Play newsstands. In this feature interview written by Dan Epstein with original photos by Patrick Hoelck, Stamos talks about the first time he shared the stage with the Beach Boys and Jimmy Page, why he loves Gibson guitars and why he prefers rhythm over melody. "They just look so cool, so pretty, so womanly. A guitar is the second sexiest thing I've had in my hands today!" "That's definitely been the highlight of my life. Who gets to play with their heroes even once? I've gotten to do it since I was 21!" John Stamos is an Emmy® nominated actor and producer. His television credits include General Hospital, ABC's Full House, and NBC's Emmy Award-winning drama ER. Stamos produced and starred in ABC's comedy Jake in Progress and Thieves and appeared in the Emmy- and Golden Globe-nominated adaptation of Raisin in the Sun for ABC. Other notable appearances include NBC's Law & Order: SVU, HBO's Entourage, and multi-episode arcs on Fox's hit series Glee and NBC's The New Normal. Stamos has had tremendous success on Broadway, having performed opposite James Earl Jones in The Best Man. He has also appeared in the Tony® Award-winning musicals Hairspray, Bye Bye Birdie, Nine and Cabaret. Along with Neil Meron and Craig Zadan, he will produce a feature musical set to the music of the Beach Boys currently in development with Twentieth Century Fox. Additional producing credits include the Emmy-nominated ABC miniseries Beach Boys: An American Family and the highly rated CBS telefilm Martin & Lewis. Stamos has also displayed his musical talents over the past 25 years while touring with the Beach Boys. He is an advocate for Project Cuddle, serves as the non-profit's National Spokesperson and Chairman of the Advisory Board, and has been a supporter of the charity for over eight years. Stamos currently lives in Los Angeles, where he recently received the honor of a star on the Hollywood Walk of Fame. Celebrates the luxury and celebrity lifestyle using the guitar as the common passion along with fine wines, automobiles, fashion, investing and travel.